Scientific Name: Aeromonas sp. or Pseudomonas sp. The difference between fin loss and fin rot are not always obvious but there is, indeed, a difference. Generally, we distinguish between the two based on its cause. 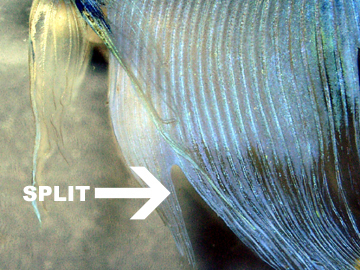 Fin loss is caused by physical damage incurred by sharp tank decorations, snagged fins, or nipping from other fish. It happens when something actually tears the fin tissue. Fin rot is the result of a bacterial infection, which leaves the fins tattered, bloody or blackened. Entire portions of the fins may fall off or go missing in the tank. The reason we distinguish between the two is because the treatment for each can be quite different. Fin rot is a gram-negative bacterial infection usually caused by poor water conditions. It is probably the number one most common betta ailment and chances are if you own bettas you will eventually deal with fin rot. Fin rot is most common in uncycled tanks where bettas are exposed to ammonia or nitrite. It can be caused by elevated nitrate levels in cycled tanks and may be caused by fluctuating temperatures and pH levels as well. Essentially, these toxins or fluctuations stress the betta, weakening his immune system, leaving him susceptible to bacterial infections. The most common signs of fin rot are a rapid loss of fin tissue, bloody fin tips or blackened fin edges. 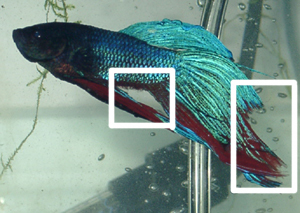 In darker colored bettas these symptoms may be difficult to spot. Upon speculation of fin rot you should immediately check your water parameters to determine the origin. Successfully curing fin rot is dependent on fixing the cause. Check for ammonia, nitrite, nitrate, ph and temperature. The ammonia and nitrite levels should be at 0 ppm [parts per million] and nitrate should be under 20 ppm, maximum. The pH levels and water temperature should be stable with little or no fluctuation from the days before. Remember, toxins like ammonia and nitrite become exponentially more significant in alkaline water [pH above 7.0] and thus much more dangerous and likely to stress your betta. This doesn’t mean you have to bring the pH down. Drastically adjusting the pH could cause more stress. It’s far better to leave the pH stable and to maintain little or no toxins in the water instead. While your betta has fin rot, it is helpful to increase the frequency of your water changes and add ammonia or nitrite neutralizers, like Kordon’s AmQuel-Plus, if necessary. If the fin rot is not severe, meaning there is still more then 1/2 of the fin left, then usually clean water and careful observation will due as treatment. It’s crucial that the betta not be exposed to any toxins while healing from the disease. New fin growth is very fragile and it’s not uncommon to have several relapses after healing begins. You may also notice the fins grow back slightly curled. While this doesn’t always occur it is normal and in no way hurts the fish. Use caution when selecting a medication for your betta. Avoid any herbal tonics or remedies that contain Melaleuca like Melafix or Bettafix. These medications are mostly antiseptics and may help fin regeneration after the bacterial infection has cleared but will do little to help initially. If your betta is sick enough to need a real antibiotic then give him one. Fin loss is usually easy to avoid and easy to fix. It can be avoided by checking all tank décor before adding it to the aquarium. Because betta fins are so fragile, they easily snag on plastic plants or sharp rocks or driftwood. An easy test can be done to avoid sharp objects. Simply run a pair of women’s pantyhose or nylons over the tank décor. If the nylons don’t snag or rip, they will be suitable for a betta tank. In many cases, the object can be filed down or sharp parts can be removed. Often plastic plants will cause fin loss so you may find better luck with silk or most live plants instead. Of course, it’s best to not add fin-nipping fish to your tank. Bettas become easy pray for quicker swimming and aggressive fish. Barbs and most tetras should be avoided in your betta tank. If you notice a fish nipping your betta you should remove the fish or the bettas as soon as possible because nipped fins can become infected and treatment could become more complicated. Betta fin tissue can heal quickly and most mild to moderate spits or holes can heal themselves without use of any medications or tank additives. It is prudent to keep your tank water clean when these minor injuries occur so as not to allow infections to develop.